This has to be one of my favourite quotes from Thelma and Louise, the classic movie about a girls’ road trip gone wild. 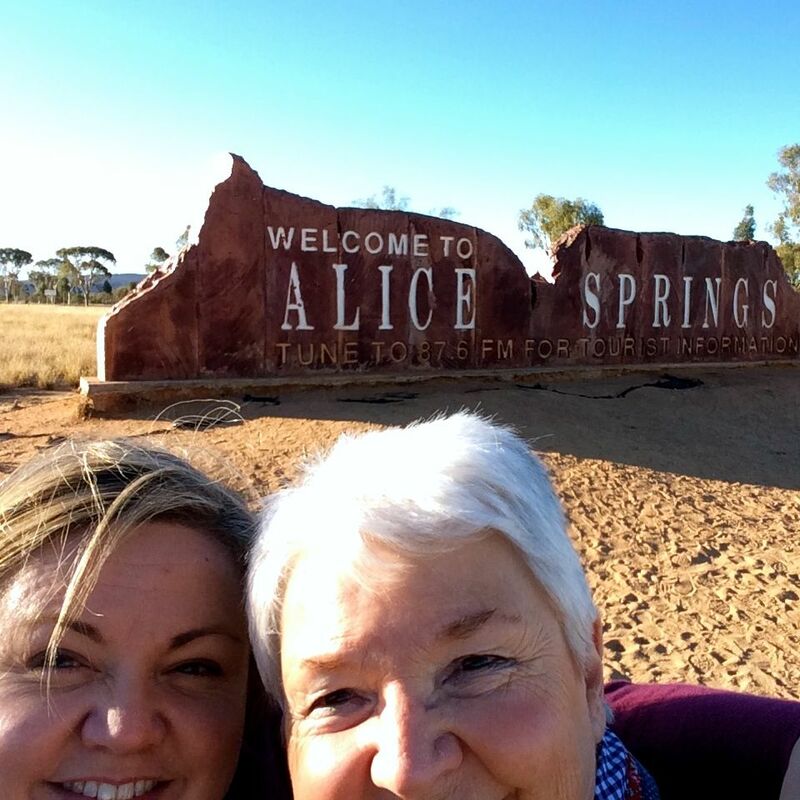 Whilst my amazing Ma and I are not exactly Thelma and Louise, we certainly had some hilarious moments on our epic Red Centre adventure in July 2014. A few years ago, I promised to take my Ma on a road trip. And so we chose the Red Centre of our Great Southern Land. Already she is quite the intrepid traveller. My mum, lovingly called Ma, has visited the Arctic three times to see polar bears, whales and walruses; camped the Canning Stock Route of WA in a swag to be a helper for a bunch of environmental scientists; spent weeks at a time in the Outer Hebrides, Greenland, Italy and Alaska; and generally enjoyed the privilege of being able to see so much of this planet. But one place that she had not yet explored was our very own Northern Territory. I’ve been to Alice a few times, spent a week at Ross River Resort at a work conference and celebrated a birthday at Uluru about ten years ago. However, this was to be a road trip – just the two girls, a Prado and a map. We both arrived separately in Alice, with Ma coming from a trip to Canberra with Dad to see the War Memorial. Dad went home and Ma came to the Red Centre. While waiting at the airport, Ma had struck up a conversation with Joy from Docker River on the WA/SA border. Joy is a community health nurse, and with Ma being a nurse herself, they struck up an immediate rapport. Together they swapped nursing stories and shared a very special hour or so just quietly talking about their different paths in life. Joy then carried on with her long journey home but not before making Ma promise to visit her at Docker River. When I arrived in Alice from Perth a few hours later, I found Ma ready and waiting for me at the baggage carousel. Within an hour, we’d collected the rental Prado, complete with mine-site equipment including a TJM bulbar, an orange beacon on the roof, a second spare tyre in the back and a UHF radio in the cab. Fortunately we didn’t need any of these things, but it was comforting to know we had them. I am used to driving my awesome Toyota Landcruiser 200 series, so for the first day or so, the Prado felt tiny and light on the road. However, we settled in to a rhythm quickly and worked out the best way to store our gear and travel comfortably. At the Big 4 MacDonnell Ranges Caravan Park we checked into a very snazzy and fairly new chalet. A pre-arranged loan of camp chairs and esky took us to the northern end of Alice, only to find the gear wasn’t there and the lender was not contactable. We planned to re-visit in the morning, but for now it was time to find food. Hanuman Restaurant at the Hilton, over near the Casino, was the only place I could remember and so we went on a bit of a mission to find it. Eventually we got there and enjoyed a lovely meal. After a good night’s sleep we embarked on a day of exploring Alice. First stop, Page 27 Café. This place is brilliant. Thanks to Trip Advisor, we found the little lane and stumbled upon a fabulous hidden treat in Alice. It was jam packed with people enjoying the retro and mismatched furniture. The service was quick; the food was fantastic and the setting clean, cozy and friendly. Eggs Benedict, two coffees each and we were set for the day. During the course of the morning we dropped into Mbantua Gallery (with a promise to return later in the week), the Visitor Centre (for maps and our Mereenie Loop Pass) and then up to the Anzac Hill lookout to get our bearings. After collecting the camp chairs and esky, we did a big shop at Coles (wow, that is the busiest Coles I have seen in a while), stocked up on some wine, dropped it all back at the chalet for later sorting, and then headed back to town. The Alice Springs Beanie Festival – let the laughter begin. 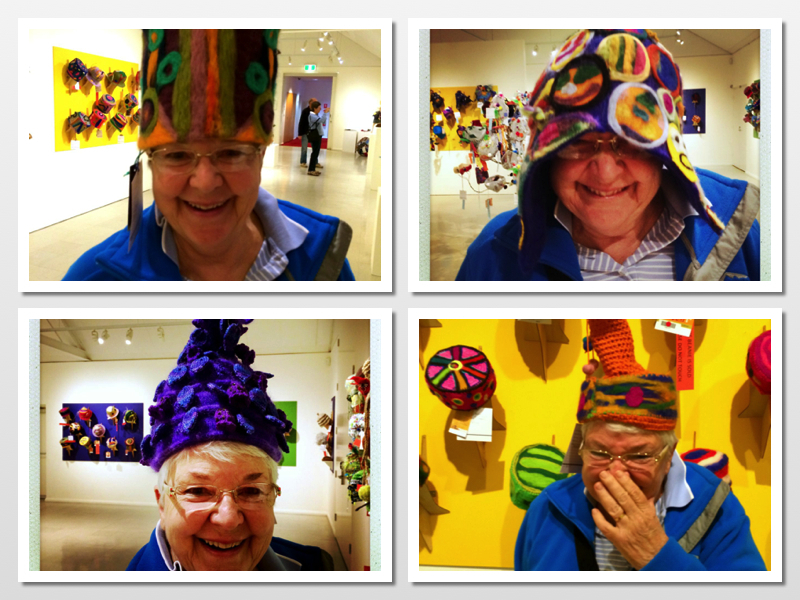 The Araluen Arts Centre and Cultural Precinct has some lovely galleries, but the one that we enjoyed the most had an exhibition of beanies from the recent Alice Springs Beanie Festival. I made Ma try on some of the most ridiculous beanies (you were allowed to try on the ones that had not already sold). I’m sure people in the adjoining galleries would have heard our crazy laughter. Some were less than impressed with our antics, however. An exhibition of paintings from Albert Namatjira and four more generations of his family, were on display in another gallery. His works really are beautiful and you could pick his paintings from the others in an instant. In yet another gallery was an interesting photo display from the Tanami Gold Mine. This photo really struck a chord with me, based on my experience of mine-site food! Next stop was the Alice Springs Telegraph station. It was an interesting step back in town and a bit hard to imagine life in these conditions with no air conditioning or running water! We read about the ‘Bungalow’ which was a boarding house (shed) of sorts, where ‘half-caste’ Aboriginal children were housed and schooled, away from their parents. We found this information confronting and bewildering. The afternoon was getting late so we decided to head back to the caravan park and say a few quick hellos to the MySwag crew who were holding their welcome night for the start of their Red Centre trip. We hung around long enough to meet a few of the mob. Looks like they were in for a ripper of a trip.